“Human life is sacred.” This is certainly a tenet of our Catholic Faith, and indeed should be for all Christians. Nevertheless, the effort to restore respect for and the dignity of human life is not only a “religious” issue. The founding document of our nation proclaims that each and every person has the “unalienable right to life, liberty, and the pur- suit of happiness.” Good old-fashioned common sense confirms what we also believe by faith: human life is unique and precious. That is why men and women of good will - of every faith, and of no faith - see the truth clearly and eloquently taught by the late Pope Saint John Paul II. We seem to be slipping more deeply into a “culture of death.” To prevent this slide from destroying us, said the Holy Father, we must embrace a true “culture of life.” This means we must work continuously to foster an attitude in our- selves and in others which respects the dignity of every human life. Certainly many in our parish and community already do this by their support of worthy efforts like Pro-Life Wisconsin, Birthright, 40 Days for Life, food pantries, and many others. The 45th anniversary of Roe V. Wade provides the occasion to make your voice heard publicly as a witness for life: in your conversations with your children, co- workers, family members, or with fellow students. If the Spirit moves you, you can even write a letter to the Editor of the local papers as a public witness. And of course, carefully examine where the candidates & political parties stand on the ‘life issues’ whenever you vote for our government representatives. I leave for some vacation tomorrow (Monday) and will return to the parish on Thur., Feb. 1. My thanks to Fr. Aaron Becker and Fr. 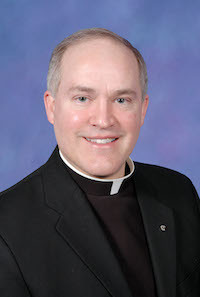 Bill Menzel who will be filling in for me during the week, and to Msgr. Robert Hundt who will be here next weekend.